A Sun.Star Cebu colleague bought an interesting phone recently. May TV. (Note: Pronounce may as mai; may is the Tagalog word for “with.”) It’s not Digital Video Broadcasting – Handheld or DVB-H, the technology used by Smart’s myTV service. It’s good old analog TV, the free-to-air signals picked up by regular TVs using antennae. MOBILE TV. Viewing QTV in TVMobile, a Chinese-made touchscreen phone that can pick up analog TV signals. The antenna at the bottom of the phone can be used as a stylus. Click on photo to enlarge. 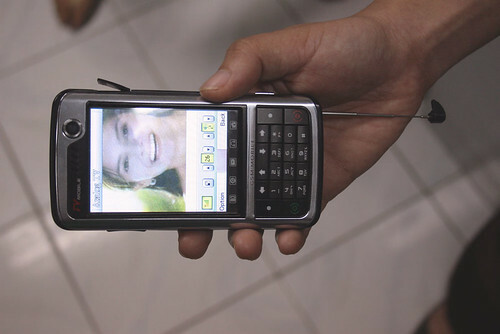 The brand printed on the faceplate is TVMobile and for P7,000 (the price when he bought it), it is chock-full of features. The phone was made in China and came with a Chinese manual. It is being sold by a stall in one of the department stores on Colon St. in Cebu City. The mobile TV offered by Smart’s myTV uses DVB-H and, apart from needing a compatible handset, you need to pay a monthly subscription fee to view the shows. With the TVMobile phone, you don’t need to pay fees, maintain a credit load in your phone, or subscribe to a service. Since it picks up regular analog TV signal, the video quality isn’t that great, unlike the high-quality video you get with myTV. The phone, according to the colleague who bought it, can pick up local broadcasts of ABS-CBN, GMA 7, QTV, Studio 23, and the Catholic Channel CCTN. Unlike myTV, which is working to expand its channels lineup, you are stuck with these channels in TVMobile. I don’t think the number of free-to-air channels will be increasing. Cable TV channels might still increase but not free-to-air. TVMobile also offers CATV connection but my colleague hasn’t tried it yet. He’s still experimenting with phone. The manual, as I wrote above, is in Chinese. TVMobile comes with a touchscreen to control phone functions. I asked the colleague who bought the phone and he said he never encountered problems with the responsiveness of the touchscreen. The phone’s TV antenna can be detached and used as a stylus. Now that is really ingenuous. Battery time isn’t that bad, he said. If you watch TV, the phone can consume a full charge in 1 and 1/2 hours. That’s more than enough time for TV Patrol Central Visayas or Balitang Bisdak. The phone also comes with a VGA camera that can take photos of up to 1,280 by 960 pixels. It can also take videos in 3GP format. My colleague said he initially thought that the phone was fragile. But after dropping it thrice, from a height of at least three feet, the phone is still working and he’s pretty impressed with its sturdiness. The phone is a GSM unit with GPRS and Bluetooth connectivity. You can increase the phone’s storage by buying a memory card. The unit can store two SIMs but only one functions at a time. If you want to use the other SIM, the phone reboots to use it. Another Chinese-made phone I know of can work with both SIMs functioning at the same time. The phone also does not come with USB drivers and a PC suite. But when you attach it to a Windows PC, the system will be looking up for MT6227 drivers. That’s your clue. Search for this driver and you can download not only it but an application that will allow you to manage the phone from your PC. After the installation, you will be asked to choose when you connect it whether you want to use the com port. Choose the com port if you want to use the PC application to send and receive messages. where particularly did you buy the analog tv mobile phone? Did he tried the CATV already? pls post some updates if he did..
where in colon?whats the name of establishment?what is the name of cellphone.Im planning to buy cellphone next month.thank you 4 d info. il wait for your reply. The colleague who bought the phone said he purchased it from a stall inside Gaisano South. He bought it for P7,000 but he said the current price is already P9,000. i sell ZT123 Executive TV Mobile phone for P9500, Iphone A8+ P11,000, Iphone A380 (iphone mini w/ biometric fingerprint security scanner) P10,000 & Nokia N95 Replica P10,000. If interested juz email me ( [email protected]) & i will send u d pix and specs. Shipping cost included in price. I’m in Cebu. A colleague of mine informed me about it this morning during our breakfast! It’s currently selling 7,500 in Colon! Now in stalls! But, still need to see for my self first! Ive seen many of those chinese PDA mobile and are sold very cheaply here in Divisoria at the same price range 7-10K there are different models. im a fan of PDA phones but this has its own OS so you cant install that much of programs like Games, Players etch unlike in nokia which uses Symbian OS also like SE P910i PDA phones or O2 pocketPC-mobile phones. on the other hand, thats a sacrifice to do because the chinese PDA/TV phones has rich features + th TV which are not readily available in any branded phones. if this mobile sure has no glitches and bugs and of good quality compared to branded phones, count me in buying one. My classmate has the same phone. Its nice, hahaha. even if it have it won os but the application inside it covers mostely every thing you want from it ..
I’ve heard of these things as recent as October but I’m not that excited because for one thing, does it have a warranty that goes with the purchase. Sure you’ve got that TV analog, but how about if the unit conked after 2-3 months of using it? Will you be able to bring it back? ei!!! my boss gave me a chinese made pda phone…as a gift…. few weeks later my analogTV broke down….then my FM radio, i can’t hear a thing but my audio player is functioning…. then, my camcorder’s and camera’s module suddenly lost…. what’s wrong?!!!! did i press anything? i dont have any manual with me…. pls help… what do i need to do?!!! or where in manila should i bring it? what type of memory card does it support? I bought a TV mobile phone also and i was wondering if you know how to install games and themes. I kept browsing and browsing but i can’t find anything. I have also that cool phone. It’s really nice can i ask you something? I’m curious about the small circle in the upper front it’s that a camera? if it is how can i activate it? I brought my TV Mobile Phone (same as the one above, the K915) off Ebay. And it was a UK seller too who gave me warranty and after sales support. It’s a great phone. please send me an english manual of the n38 pda mobile thru email should you have one. thanks!!! the small circle in the upper front functions as video player. hope this clarifies your question. Thnks matz.. by da way can i make video call wid that thing?.. hey i have a tv analog phone but i was wondering is any1 nows how 2 get the tv to work in australia. as that is one of the reasons i bought the phone. Can’t the phone detect TV signals there? As I recall from my colleague’s demo of it, the phone helps you in setting up channel detection for your country. Have you tried it? it has a option of select area but australia isnt in there and the person i bough it off from ebay said it would work in australia, so not sure what to do now. If any had already used the front cam please tell us how? because i cant find the way using it !!!! send naman jan ng filipino manual oh..tsaka kng san pwede mag download ng themes at games..tnx po! ABOUHA.. just opne your cam then on the lower most icon.. the one with a camera 1 and 2 icon.. press it.. ther you go your… front camera..
kenkoy… can u send me an english manual if you have.. limited ba yung.. n38 to 2 gigz?? hindi na pwe.de ung 4 gigz? meron ba DITO sa maynila nyan?where? i also need english manual pls send me one thx. meron na cguro sa manila nyan.. nde ko lng alm kng san. dapat ksma na ung englis manual. nun bnili ko kac yan ipod lng ksma..
i just bought one too… can someone email me a copy of the english manual? thanks!!! which software should i use to sycronize the TV mobile to sycronize my contacts with PC and Mobile. i have a ZT 168 china phone. and its working realy well. in fact i like to use it more than my nokia n90. kasi daming features eh. then need not install cd for pc connection. e connect mo lang ang usb cable niya then the phone is connected to the computer na. u can transfer files from pc to your phone or from your phone to your pc. and am very satisfied to use this. okey and tv reception except abs cbn. well…..as we know absc cbn has very poor reception dito sa cebu. pls can anyone help me with the english manual of ZTC N38? my email add is [email protected]. Also, pls does anyone han an idea where i could get an ebook reader for it n which type? thanxs. I brought a TV MOBILE from a shop in CAMEROON. it was cool and had no problem but after three months I was trying to transfer music from a frends motorola L7 to my TVMOBLE, after the seach through bloothoot my phone started behaving fun going on and off alone, since the I cant use My Beloved TV MOBILE that I realy like. please if you can give me any technical assistance i will be greatfull. hi ! m harry i got zt 303 wow it works !!! great using it’s features but can ne1 helps how to run games and install softwares, tried a lot but ………. does N38 china phone has the capability of downloading games, themes etc.? & how can i open gprs & mms since the process to activate it is requiring a legal handyphone model. hi max, i’m one of your many readers on sun star’s cell talk! i read your article today and is very intresting on trying the new and hip umobile sim.. can i pls. have an invite? thanks so much for the informations you gave us regarding cellphones. hey, do you still have any invites left for umobile? coz i’m interested. I’ve just bought ZT321 as a gift to my sister in the States from MarketMarket. My sister loved it. tv is working ok, except for the phone. can anyone help me. its still under warranty. but it cant detect any SIM. it always: no service or insert sim. Its nice phone I have one already but it cannot log on, so I would like to have the software so that I can re-install. thanks in advance. meron b kaung english manual ng N38+ pahingi nmn ng copy.. THAnxzzz..
hi! baka naman pwedeng makahingi ng manual ng N38 english version …. thankz..
i have the phone but i really don’t know how to install i, the GPRS settings, how to install new theme. f there someone here who have a knowledge on what was the solution of my problem about my CP, can you send it at my email add? pls. here’s my address, [email protected] here’s also my number, just in case somebody know how to help me. thanks, GOD bless.